When you borrow money from a bank, you may want to track some information that relate to your payment to the bank. These information can be old balance , monthly payment, interest paid, principle paid, and new balance from the start month to the end of borrowing period. The AmortizationProgram here can assist you to obtain these information. The program allows the user to input the amount of load, interest rate per year, and number of years. 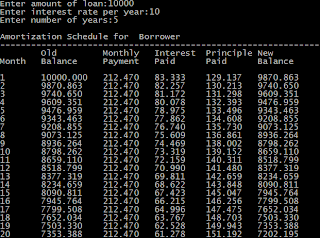 Then the program displays an amortization schedule that includes the information as mentioned above. The formula used to calculate the monthly payment is shown below. 1 include Scanner class to the program. This class is used to get user input from keyboad. 2 open AmortizationProgram class block. 3 open the main method. 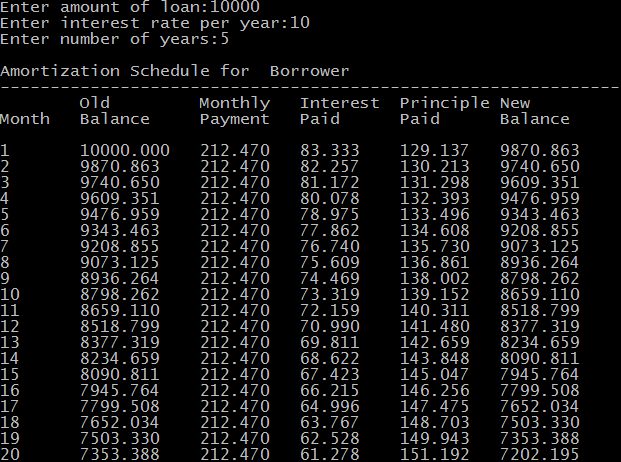 4 declare local variable p, and iy to store amount of principle, and interest rate pery year. 5 delclare local variable n to store the number of years. 6 create Scanner object sc. 7-12 allow the user to input amount of loan, interest rate per year, and number of years. 13 call the calAmort method to calculate monthly payment and print the amortization schedule. 14 close the main method. 16 declare local variable newbal to store the new balance for each month. 17 declare local variable im to store the interest rate per month. 18 declare local variable nm to store the number of months. 19 declare local variables mp, ip, and pp to store monthly payment, interest paid, and principle paid for each month. 20 declare local variable i used in for loop iteration. The for loop exits when the test result is false. If the test result is true forever, the loop works infinitely. The update has to properly define so that the loop will exit when ever you want. 31-36 calculate interest paid(ip), principle paid (pp), old balance (p), new blance (newbal) for the last month, and print these informaton by calling the printSch method. For the last month, it is a special case. The principle paid is set to the new balance of the previous month. The monthly payment is set to sum of principle paid and interest paid, and the new balance is set to zero. 37 close the calAmort method. 38 open printSch method body. 39 define the code to print information. 40 close the printSch method. 41 open printHeader method body. 42-46 define code to print the heading text. 47 close the printHeader method. 48 close the AmortizationProgram class. 1. To convert a numerical variable that is not a double type to double type, you has to place the double keyword in parentheses before that numerical variable. 2. The pow(double value,double power) of Math class is used to find the result of a value raised by its power.